We are delighted to have had Prof. Zeigler, an expert on African American English (AAE), speak with our class in a discussion of language politics. Professors Block and Zeigler engaged in a conversation on the historical parallels between Yiddish and Ebonics. 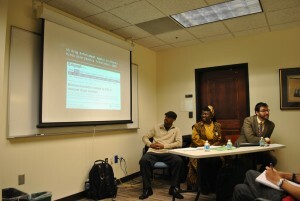 Professor Zeigler was accompanied by her research assistant Benjamin R. Moore III. This was made possible through a teaching grant from the Emory Center for Faculty Development and Excellence. Audio recording and one of the two Powerpoint presentations are provided below.